We have seen elsewhere (see Effective Voice Projection) that the key to projecting our voice with sufficient loudness, and without exertion, is to integrate a handful of vocal behaviors, i.e. In addition to the above, whether standing or sitting, it is essential that we adopt a good posture. A good posture helps with breathing and reduces any unnecessary neck, shoulder and back muscle tensions. Avoid slouching and leaning forwards or to one side. We often tend to slump when we are tired, so be vigilant. A trick to remind you to check your posture regularly is to select some action or event that occurs fairly regularly, e.g. switching on a kettle, flicking a light switch, checking the time on the office clock. Every time you perform this action, use it as a reminder to also check out your posture, e.g. ‘Am I relaxed?’, ‘Am I sitting in an easy, upright position with my spine vertical?’, ‘Am I clenching my teeth together?’ Sitting or standing in the correct posture should feel fairly effortless. It should be relatively easy to maintain. Adopting a good posture will go some way to helping you avoid unnecessary strain when projecting your voice. It is important to remember that good vocal technique does not involve excessive effort, pushing or straining of any muscles. In reality, the voice will be strongest when you relax. The keyword in all voice improvement work is gentleness. If you are straining in order to project your voice then you may need to revise your technique. To reiterate, there should be no straining when working with your voice, this is especially true of working on the loudness of the voice. The energy required to increase your loudness should be directed to controlling your diaphragm. You should, therefore, use a good diaphragmatic breathing technique throughout. Your throat should be open – if you feel it closing then introduce a yawn before taking a breath, this will open up the back of the throat. There should be no increased tension in your larynx. You are aiming to relax the muscles in the head and neck area, open the throat, use a proper diaphragmatic breath and use the upper chest as a resonator to amplify the sound. Start softly and then gradually, and as smoothly as possible, increase your loudness. Remember, you are not trying to shout or scream but to create a contrast between a soft conversational voice (e.g. talking to someone just one meter away) and a louder conversational voice (e.g. talking to someone about three meters away). If it helps, imagine that there is a wire extending from your mouth that is tied to some object in a room about three meters away. As you increase your loudness, imagine that you are sending the sound along the wire to meet the object. 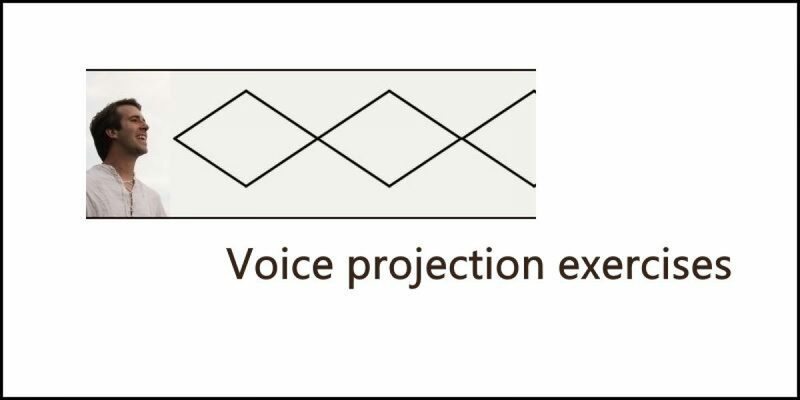 This may help to create a mental image of projecting the voice across a short distance. This is the reverse of Exercise 1. As you are staring loudly this time, be careful that you do not use a hard attack when initiating the vocalization. Remember to use easy onset at all times. If you do find that you are hitting the vowel too harshly, simply put a short /h/ sound (as in the word house) before the vowel. This should help to bring the vocal folds together gently before they start to vibrate. Doing this exercise gently and smoothly almost sounds a little like a car approaching you and then passing by and away – the engine is quiet to begin with, it gets louder as it approaches and then quiet again as it moves off into the distance. This exercise sounds a little like an ambulance siren – alternating between soft and loud, soft and loud. NB: When performing the above counting exercises, you will need to divide up each utterance into manageable lengths – of a size that you can speak comfortably on one breath, without straining. For example, Exercise 1 requires you to count to 10. If your breath control is such that you cannot currently perform this exercise comfortably on one breath, then you can divide it into two – taking a breath after ‘5’. It is usually easier to replenish your breath supply after speaking a loud sound. In these exercises the idea is to sustain and project the voice by intoning words and phrases. This means that you exaggerate the vocalization of the vowel sounds by lengthening each vowel and continuing the voicing through the whole word. Imagine you are filling the room with a rich, resonant sound but be careful that you are not increasing the muscle tension in the head and neck area or in your general posture. When speaking phrases, imagine that you are speaking just one long word and keep the vocalization going from the start of the phrase until its end. There should be an almost continuous voicing with no breaks between the words. Using the same intoning technique recite the following. Again, you will need to give some thought as to when you will take a breath, e.g. after every three words when reciting days of the week and months of the year; after every five numbers when counting. As voice projection requires the coordinated integration of breathing, easy movement of the vocal folds and muscle relaxation, it can be difficult to master. Whilst the above exercises are designed to help you develop control over voice projection you need to convince yourself that you are carrying out the exercises properly. In order to avoid developing any potentially harmful habits, you will likely benefit from being taught by a qualified professional. If you have concerns about a continuing or recurring voice difficulty please consult a qualified speech-language pathologist.